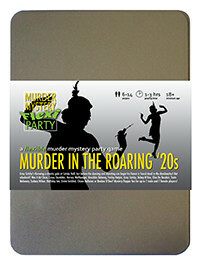 You've been invited to play the role of BEBOP B’DOO in Murder in the Roaring '20s. Gray Catsby has invited his most talented and wealthy friends to a charity gala event at his countryside residence, Catsby Hall. But before any dancing and donations begin, Catsby’s fiancée, Ginger Whiskers, is found dead in the dumbwaiter! Join the flappers and dappers to find out who finished her off! You have a penchant for blue suits matched with bowties or cufflinks bearing musical symbols. You wear glasses for reading sheet music, and carry a harmonica or tuning fork to ensure you’re pitch perfect. Encouraged to play the piano from the age of five, you were somewhat of a maestro by twelve. Unfortunately, there wasn’t much money in the whole classical side of things, but music halls and clubs were paying big money to get live acts in, so you decided to concentrate on that. Your partner, Booboo, responded to an advert in the local newspaper for a singer - and she’s been your other half ever since. I’m Bebop B’Doo, jazz pianist at your service. I was scheduled to perform here with my wife tonight, and we’re happy to still play on, but either way we’ll be expecting to get paid. Ginger hired us originally, but surely someone is going to foot the bill? I’m not sure why I’m a suspect - I took a long walk outside before dinner and didn’t see anyone. Who fancies a game of poker while we’re waiting?